[Judge James] Fox said in his judgement that the state's plan violates the First Amendment. 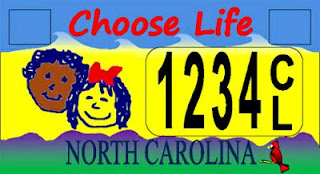 The proposed license plate featured two children with the words "Choose Life" printed above them. "The State's offering of a Choose Life license plate in the absence of a pro-choice plate constitutes viewpoint discrimination in violation of the First Amendment," he said according to MyFox8. Wait, how is it "pro-choice" to object to the slogan "choose life"? The first word is "choose"! It must be that they aren't really pro-choice but pro-a-particular-choice, whatever choice is the opposite of death. So why doesn't North Carolina just offer a "Choose Death" license plate? Or if that's too morbid, "Don't Choose Life"?